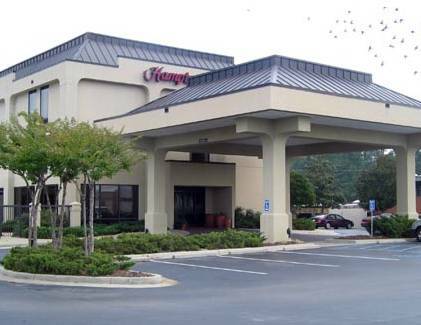 The Hampton Inn Gadsden hotel is located at the intersection of I-759 and Hwy 411 across from the Gadsden Mall and 1 mile south of downtown Gadsden Alabama. Area attractions include bass tournaments museums universities Noccalula Falls* 90 foot waterfall golf auto racing shopping and Little River Canyon State Park. Within .1 mile our hotel guests can dine at Arby*s McDonald*s Ruby Tuesday*s Logan*s Steak House Ryan*s Steak House Villa Fiesta Wendy*s or Taco Bell. The Hampton Inn Gadsden hotel feature 3-stories with 100 rooms 2 elevators and outdoor pool. Amenities include complimentary continental breakfast voicemail and 25** TV with cable and stereo. We also offer connecting rooms cribs hair dryers and irons. Meeting/banquet facilities are available for a nominal fee. Wireless high- speed internet is also available at no charge. We love having you in Alabama at the Hampton Inn Gadsden hotel. All reservations must be GTD with a major credit card or adv cash deposit to hotel regardless of time of arrival. All reservation must be cancelled by 6pm host time or cxl hour unless deposit required. Policy is subject to change. A veterans memorial park reflecting pool has the comforting shape of the state of Alabama.